Microsoft Exchange Server is the backbone of messaging service in most of the organizations and works in synchronization with the Active Directory. Hence, management of Microsoft Exchange Server is as important as managing the Windows Active Directory for any administrator. But under the existing management architecture, an administrator has to switch among "ADUC", "Exchange System Manager", "Exchange Management Console", "PowerShell" and "Exchange Management Shell". Using the native Exchange and Active Directory tools, it is an extremely tedious and taxing task to monitor and control the Windows Active Directory and Exchange to ensure optimum performance. Moreover it is not possible for administrators to manage Exchange 2003 and Exchange 2007/2010/2013/2016 servers simultaneously in a single console. Even, allowing help desks to just create mailboxes alone is not viable as the help desk must be granted full organization rights to create mailbox. Also, the existing exchange management console does not provide any support to set mailbox properties like mailbox size, mailbox recipient, mailbox recovery, etc, while creating the mailbox for users. Hence, the need of the hour is a software which implements all these administrative needs into features. "All–in–one" user management console - Enables management of Exchange Server and Active Directory from a single console. "Multi–mode" operational console - Allows administrators to manage both Exchange Server 2003 and Exchange Server 2007/2010/2013/2016 simultaneously from a single console. Administrators can delegate help desks the rights of creating and setting mailbox properties by assigning the ready-to-use "ADManager Plus templates" to help desks. 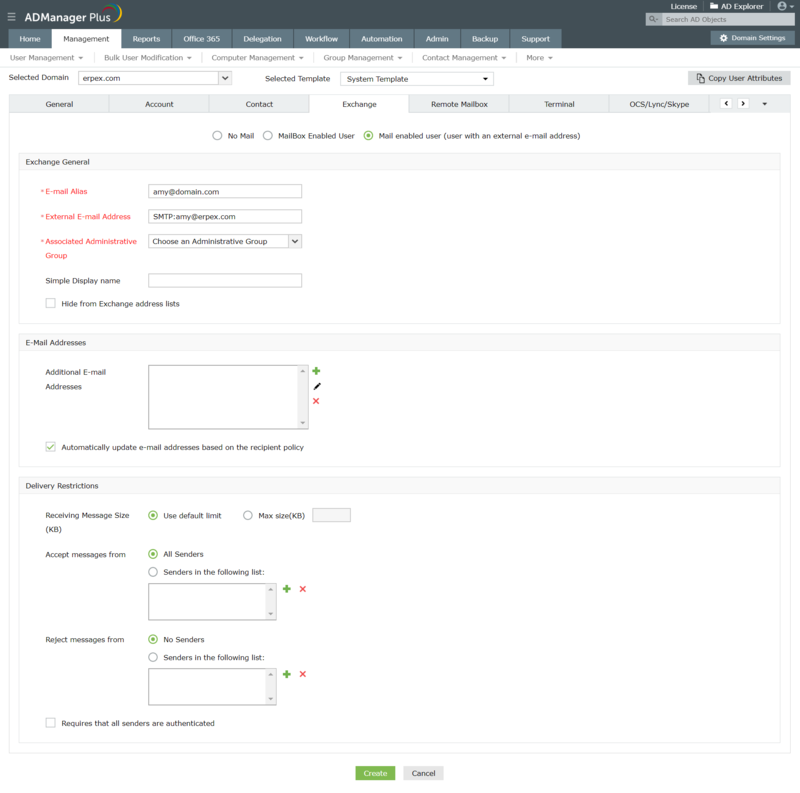 Disable / Delete Exchange Mailbox - deleting a User's Exchange Mailbox becomes a simple GUI activity in ADManager Plus, freeing you from having to toggle between ADUC and Exchange's native tools. Manage Shared Mailboxes - Shared mailboxes in different versions of Exchange can be effortlessly created and modified. Manage resource mailboxes - Resource (room and equipment) mailboxes in different versions of Exchange Server can be easily created and modified. Create remote mailboxes - Remote mailboxes can be created in Exchange Server 2010, 2013, and 2016 while provisioning new AD accounts for users individually, as well as in bulk. Finally, adding to the myriad list of amenities, ADManager Plus alleviates the administrative burden by enabling "creation of mailboxes and setting mailbox properties" for bulk users by just importing a CSV file. Exchange mailbox creation for users is an imperative task for Active Directory administrators to facilitate business communication in organizations-through emails. With ADManager Plus, the easy-to-use Windows Active Directory Management and Reporting tool, administrators can create mailbox as well as set mailbox properties – both during user creation. Following are the property modifications that can be carried out along with mailbox creation. Modify SMTP address: You can easily add multiple email addresses for users ensuring they all map to the same mailbox. Modify exchange features : You can enable/disable the exchange services attributes which include: Outlook mobile access(OMA), Outlook web access(OWA), POP3 protocol and IMAP4 protocol. Set Delivery Restrictions: Easily reset the sending/receiving mail size of the users. Set Delivery Options: Easily set/reset "send on behalf" and forwarding address. Storage Limits: Change the storage limits of user's mailboxes. Administrators can set mailbox rights for bulk users at a time very easily . In Exchange 2007/2010/2013/2016 Server, you can set mailbox rights only using the Exchange Management Shell, but with ADManager Plus, you can carry out all the exchange tasks in the product itself. With ADManager Plus, administrators can easily set offline address book for users within a few clicks. Also, it is possible to set offline address book for bulk users at a time by just importing a CSV file. Delete the mailbox of multiple users in one single operation. Disable/Delete the mailbox for different versions of Exchange from one single console. Locate the users whose mailboxes have to be deleted using the search option or provide the list of users using the CSV import option. ADManager Plus makes it surprisingly easy and quick to generate all the required information about Exchange infrastructure such as distribution lists, feature based reports, etc. These reports can be exported to different formats (CSV, excel, etc.) and can also be scheduled. Besides, you can also create dynamic distribution groups in multiple Exchange Server versions. ADManager Plus's 'Exchange Mailbox Migration' feature turns the process of migrating the Exchange Server mailboxes between different versions of Exchange (2003, 2007, 2010, 2013 and 2016) into a simple and easy one. ADManager Plus allows easy creation and modification of shared mailboxes and resource (room and equipment) mailboxes in different versions of Exchange Server. It also facilitates creation of remote mailboxes in Exchange Server 2010, 2013, and 2016, while provisioning new AD accounts for users individually, as well as in bulk.